A while ago you may remember there was a news story about a statue being erected to Charlie Chaplin in Kazakhstan. The news reports said that it was the twelfth such statue of Chaplin worldwide, and so the Bioscope put on its reporter’s hat and sought out the other eleven – in London, Vevey, Waterville, Oslo, Shanghai, Mérida, Alassio, Gabrovo, Paris and Los Angeles (two statues). You can read that report and see photographs of eleven of the twelve, but now news emerges of plans for a thirteenth statue – plans that, however, seem fated to come to dust. We are shooting a song sequence in Maravanthe Beach where this 62-feet statue of Charlie Chaplin is being shown. It will remain a tourist attraction after we finish the film’s shoot …We have applied for recognition from the Guinness Book of World Records. David Brown from the Guinness Book is expected to arrive in India to scrutinise our claim. The statue was to be built by the film’s art director, Chethan Mundadi, at a cost of 3.5 million rupees, subject to permission from the Karnataka government. Installation was expected to take place on 28 March, and the BBC was reportedly going to film the event. That was last week. 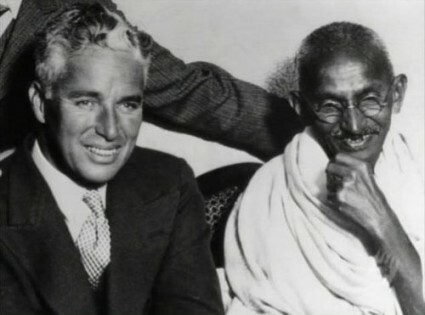 Not long after Hegde has announced his plans, furious objection was made by proestors, said to be members of the radical Hindu Jagarna Vedike group, arguing that the statue of Chaplin should not be built because he was a Christian. The existence of some important Hindu temples near to the proposed site had compounded the sense of insult. They have demanded that the filmmakers instead erect a statue of the 19th-century Hindu missionary Swami Vivekananda. The row is growing, and has wider political ramifications. Protests have been made by the film and theatre communities, while Hegde has expressed his bemusement and says he is now looking for another site. But, as The Times of London reports, the Hindu Jagarna Vedike protest is part of a wider revolt from ‘extremists’ opposed to Western cultural imports, raning from Valentine’s Day celebrations to cheerleaders and Indian Premier League cricket matches. Hindutva brigands attacking a statue of Charlie Chaplin on the grounds that he was a Christian and having his statue close to a temple was offensive to Hindu sentiments may appear too bizzare to be taken seriously. It is indeed ludicrous. But unless such groups are dealt with summarily and the nuisance nipped in the bud, what seems farcical today could become tragically real tomorrow. The state government must show that it will not allow such lumpen activity to go unpunished. It must crack down hard to deter potential imitators of such trends. How can anyone discriminate against an artist on the basis of religion or caste? Chaplin belongs to all.